As teams jockey for slots in the upcoming World Cup, research presented at the Society for Neuroscience meeting indicated that women may be more at risk from “heading” the soccer ball than men. 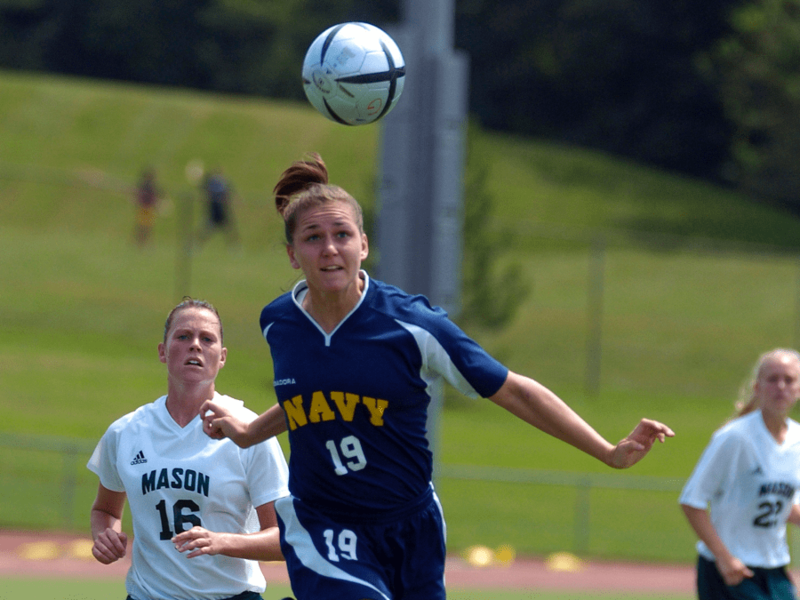 The survey of amateur soccer players found that women who regularly took sub-concussive hits with the ball were more likely to have damage to the neural white matter than men. The researchers aren’t sure why, although they suspect that differences in body mass or neck strength may distribute the force of ball impacts differently. Sophie Bushwick, senior editor at Popular Science, joins Ira to discuss that research and other stories from the week in science—including a dire environmental warning, the psychology of upping your vegetable intake, and a dietary caution as we look ahead to the Thanksgiving holiday. IRA FLATOW: This is Science Friday. I’m Ira Flatow, broadcasting today from WFPL studios in Louisville Public Media in Louisville, Kentucky. [INAUDIBLE] science committee is acknowledging that climate change is a threat. But instead of curbing emissions, committee chairman Lamar Smith is interested in geoengineering. That means cooling the globe in other ways, like spraying sulfur dioxide in the stratosphere. We’ll talk about climate modification and some of the scientific and political consequences of it later in the hour. But first, men’s soccer teams are jockeying for slots in the 2018 World Cup, with Italy failing to make the cut this week. Boy, they are heartbroken. The US men’s team is out of contention as well. The next Women’s World Cup isn’t until 2019. But there, the current champion US women stand a better chance. And new research shows that there may be another difference between men’s and women’s teams, and here to tell us about that and others selected short subjects in science is Sophie Bushwick, senior editor at Popular Science. Welcome back, Sophie. SOPHIE BUSHWICK: Thanks for having me. IRA FLATOW: So tell us about this research that says that heading a soccer ball might hurt women’s brains more than men’s. SOPHIE BUSHWICK: Right, so when you think about brain trauma, we tend to think more about, maybe, you know, football players as opposed to soccer players. But even though when a soccer player heads a ball, they’re not hitting it hard enough to get a concussion, they can still, over time, damage their brains. And studies have found that in soccer players who head the ball 1,000 times a year or more, they do see changes in their brains. And then a new study has looked at whether those changes are the same between male and female soccer players. So they looked at some amateur players, 49 men and 49 women, and then they compared them with people with a similar age and a similar amount of times that they would head the ball. And they found that women tended to have damage to a greater part of their brain and to more discreet areas of the brain than men who headed the ball the same amount. IRA FLATOW: So this is different from a concussion then. SOPHIE BUSHWICK: Yes, this is different. This is called sub concussive. It’s not– It’s hits that aren’t hard enough to give you a concussion but can still, over time, with repetition, change the makeup of your brain. IRA FLATOW: Do they know why there’s a difference here? SOPHIE BUSHWICK: There’s a couple of different theories. One is that, in general, women are physically smaller and tend to have weaker necks than men. And so it could be that the same amount of force does more damage. But we’re not sure yet. Another theory suggests that it could be something due to genetics or to hormones. One thing we do know is that women are also more likely to get concussions. And when they do get concussions, it takes longer to recover. IRA FLATOW: Let’s move out to a cheerier subject, and that is that thousands of scientists have put humanity on notice again. I guess, not that cheery. SOPHIE BUSHWICK: A lot less cheery. So this is actually based on an open letter that was written in 1992, 25 years ago. About 1,700 scientists signed on to this letter saying, look, humans are damaging the environment. We are causing unsustainable changes. And if we don’t stop soon, we’ll pass the point of no return. And now, 25 years later, 10 times as many scientists have signed on. So we’ve got about 16,000 scientists saying we are causing major damage. In the time since that original letter came out, the global climate has increased by 0.5 degrees Celsius. We have more deforestation. We’re having less access to clean water– clean, fresh water. And in the oceans, fisheries are declining, which is a sign of overall ocean health. And plus, we’re losing biodiversity. So while we’ve got two billion more humans on the planet, we’ve got– a lot of other vertebrates have declined by about 30%. IRA FLATOW: These, I imagine, are different topics than we’re talking about when the original petition was out there in what, 1992. SOPHIE BUSHWICK: Well, some of them are the same. So in 1992, there were still concerns about climate. There were concerns about deforestation, about lack of sustainability. There is a bright spot though. So one thing that has changed is that the ozone hole has gotten a little bit smaller. So it’s currently at its smallest point since 1988, because we’ve been phasing out the chlorofluorocarbons, which used to be in air conditioners and refrigerators, and those were causing real ozone damage. So the fact is, we can take action to mitigate some of these changes. But the question is, will we? IRA FLATOW: Yeah that is an interesting point you make, that people are– they say, we can’t do anything. But that shows that if we do take action, we can have effect. IRA FLATOW: And ozone, of course, is not as big a concern these days. SOPHIE BUSHWICK: We’ve got bigger fish to fry, unfortunately. IRA FLATOW: And the fish are fried. Next week, of course, is the Thanksgiving. And while there’s going to be lots of starches and turkey, scientists have come up with some psychological tricks to make you eat your veggies. SOPHIE BUSHWICK: Right, so something like 90% of Americans don’t get enough vegetables each day, because a lot of people don’t like the taste. But there is psychological trickery you can use. So in one study, scientists used peer pressure. They put up posters that said something like, most students at this facility like to have vegetables with their lunch. And just being exposed to that poster made students more likely to have vegetables with their lunch. IRA FLATOW: And so there’s a social pressure there. SOPHIE BUSHWICK: Yeah, yeah, there could be some social influence there, encouraging people to eat vegetables if they think that their peers are. IRA FLATOW: Yeah, and we have found there– You’re right. There’s research that shows if your friends do something, they may influence your way of looking at things also. IRA FLATOW: Wait a minute. How does that work? SOPHIE BUSHWICK: So we tend to be pretty suggestible about memories. So if someone said to me, oh Sophie, remember that time when you were little, and we had asparagus for dinner, and you were so happy, and we had that amazing conversation? A part of me might be kind of unsure. But the fact that the other person is so confident about it could cause me to create this false memory, and I might really think that that had happened, and I could even, maybe, supply some details myself. Like, oh yeah, I remember that was when we were eating off those blue plates we used to have, or something like that. And by encouraging that kind of false memory, people who had warm and fuzzy vegetable memories tended to start eating more of that vegetable. IRA FLATOW: Well here’s wishing you happy veggies on Thanksgiving, Sophie. IRA FLATOW: Thanks a lot. And Happy Thanksgiving to you. IRA FLATOW: That’s about all we have for Sophie. Sophie Bushwick is senior editor at Popular Science. Thanks again for being with us today. Archeologists agree on an early coastal route for ancient humans crossing from Siberia...and it’s not the land bridge. Plus, dog sacrifices in the Bronze Age.